The incredible story of one man's row to America in three stages. From England to the Canaries, to Antigua and then on to Miami, Florida. (...with special thanks to the Independence Seaport Museum in Philadelphia, Pennsylvania for the photos of Sidney and donation of his boat to the Ocean Rowing Society for the ORS museum. Also thanks to Sidney's daughter Isabelle for the logs from this amazing story). By February 18, 1970, after 55 solitary days at sea, Sidney Genders was down to one day's supply of rationed, brackish water and a few grains of hope. It was the low point of the entire voyage. His spirits had spiked briefly when a ship overtook him, a mile away on a parallel course, but they fell to the sub-basement when his frantic attempts to signal with a broken mirror went unnoticed. As the ship, with its promise of food and water, vanished over the horizon, he was overcome by a bone-crushing lethargy. Scorched by the sun, tortured by thirst, he slumped onto the floor of the boat, wondering, for the first time, if this were the end. He had a blinding headache, an early symptom, he knew, of dehydration. What he didn't know was how long it would take to finish him. He decided he better leave behind some final words, souvenirs perhaps for the critics who had suggested he was crazy for trying to row the Atlantic and a cheat for carrying a sail, who had ridiculed him when he turned back after trying to row the northern Atlantic. In view of the water situation, I ought to make a few points clear. My practice of carrying a bit of sail provoked a bit of criticism. But I felt and still feel there should be a way out for the lone rower who gets into serious trouble, such as injury or lack of water. There is no one else to help and he must depend entirely on himself. However, in view of the last criticism I heard about my sail, I threw it into the sea. I now have no way out--no radio transmitter, no signal flares, etc. I hope the critics are content. It is remarkable that if a lone rower carries a sail he is a cheat. If he does not he is a suicide. I don't think it would be very enlightening to list the growing symptoms of dehydration--they are well enough known. I will confine my writing to the usual facts and figures. There will be no whining. 19th February. I made a big effort last night and sculled throughout. It was a fine night, almost a full moon. But I had to drink the last of the water. The day was very hot indeed, temperature rising to 117 degrees F in the sun at 2 p.m. Squalls passing all day, some quite close, so I spent some hectic moments rushing about erecting R.W.C. devices (to catch water), but had no luck. All the squalls missed! However, the wind they caused made the sea quite choppy. 20th February. First day without water. Wind has veered to South Southeast making progress slow and difficult. No ships during the day and no squalls. 21st February. No rain. No ships. Second day without water. Eating only canned foods, beans in tomato, spaghetti in tomato, etc. because of their liquid content. On the morning of the 22nd, Genders spotted a cargo ship on the same course as he, two miles away. He signalled, by heliograph, fog horn, and oar waving, but got no response. Bitterly disappointed, he fell into another lethargic funk His sculling rate fell to a small fraction of his usual 23 strokes per minute. This went on for some time, until he was yanked from his abyss of self-pity by recalling the last words of his spiritual leader, Gautama Buddha: "Be islands unto yourselves. Be a refuge to yourselves, do not take to yourselves any other refuge. See truth as an island, see truth as a refuge. Do not seek refuge in anyone but yourselves. It is they who do this who shall reach the further shore." The following day, his patience was rewarded. 23rd February Just before dawn a squall hit to provide half a gallon of brackish water, but it tasted mighty good in tea and coffee! No ships. The next day he decided the water shortage was too severe to continue west to Florida; he would head for the islands to the southwest--Barbuda, Antigua--somewhere he could land to replenish his supplies before continuing on to Florida. Antigua, 450 miles away, seemed the most likely target. Sidney Genders spent his childhood in the little village of Lynn in Staffordshire in the heart of England. His father and both grandfathers were building contractors, and Sid developed some skills in that trade. But rather than follow in their footsteps, he decided to go to sea. He joined the British Merchant Navy, and over the years served on dozens of ships as Bosun, 3rd Mate, and 2nd Mate, roaming from the Arctic to the Antarctic. "I was at sea throughout the Second World War, and during those six years, experienced the same sort of adventures as thousands of other seamen of that period. There was a story to every ship and every voyage. The nervous strain of being almost continuously at sea under wartime conditions was considerable. (The British Merchant Navy lost more men, percentage wise, than any other service.) I was luckier than most, but even so, by October 1945, was glad to leave the sea in order to lead a more normal married life ashore." He went into the building and decorating business, running his own small business for the next twenty-four years. Married life was good for much of that time. He and his wife raised two children before they began to drift apart, finally separating in 1963. For years Genders had toyed with the idea of retiring at age fifty. As his fiftieth birthday approached, the idea became a commitment. He decided he would quit the business rat race while still young and healthy enough to do things. Exactly what things wasn't clear. His son and daughter were grown, leaving him without family responsibilities. The world was his oyster, which he could explore any way he wanted. But how? The problem wasn't that nothing came to mind, but that too much did. Sports and physical fitness had long been a high priority for Genders. His uncle, one Harry Genders, was an internationally known racing cyclist in the 1920s, and for years Sidney shared that passion. It was on a bicycle that he first explored his powers of endurance, and he quickly developed a love for the longer events. At age 41, he rode 425 miles at the 24-hour National Championship. After Sidney and his wife separated, he lost interest in training six hours a day as a serious cyclist. Needing a change, a new conduit for his formidable athletic energies, he turned to rock climbing and caving, much of it solo. "It's a fine exercise in getting to know oneself," he explained. "It's also a fine exercise for developing confidence. To find yourself stuck on a vertical rock face 250 feet high with no one to turn to for advice or assistance develops self-control and self-confidence to a surprising degree." His thoughts inevitably returned to the sea he knew so well--the Atlantic. He had followed with interest the exploits of the 1966 ocean rowers Johnston and Hoare (unsuccessful), and Ridgway and Blyth (successful). His vast experiences at sea, he felt, heightened his appreciation for what those men had to endure. He couldn't help wondering how he himself would fare in the face of such deprivation and hardship. Most of the time he concluded he would do very well indeed. Sure, he was older than the other rowers, but what difference did that make? He was strong and fit, and knew the North Atlantic better than those other men. Plus he was already an oarsman. Sydney Genders put two and two together and came up with an outrageous plan: He would become the first person to row the Atlantic single-handed. With few expectations, he put an ad in the London Times asking if anyone was interested in racing from, say, Nova Scotia to England. Not surprisingly, no one replied. He would do it alone, just as he had biked and climbed and caved alone. The more he considered the challenge, the more it seemed the perfect measure for him. With his record in endurance events, he reckoned that once he was sculling fit he could pull for fifty minutes each hour, sixteen hours a day. The question was, how long could he hold such a pace? He decided a month was the longest he could expect. That meant trying the shortest route possible: St. Johns, Newfoundland to Dingle Bay, Ireland--1500 miles. To complete that run in thirty days, he would have to average 50 miles per day, a daunting but not impossible task. After all, in 1896, Harboe and Samuelsen averaged almost 60 miles a day. As Genders soon discovered, he was not as alone as he thought. 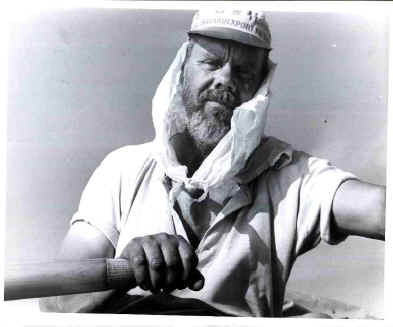 Early in 1969, John Fairfax announced that he would row the Atlantic single-handed from the Canary Islands to Florida. In response, Genders decided he would be the first to row the Atlantic round-trip. But first he needed a boat. He chose a Portuguese dory design made of mahogany marine ply, with a flat bottom and no keel, all the better to slide over the crests of waves. Since wind is the primary enemy of the ocean rower, Genders made the boat as low as possible, about two feet lower than Fairfax's boat. It took in more water than it would have otherwise, but Genders felt the low profile, with its greater efficiency, was adequate compensation. He had taken to calling her, simply, "Boat," but eventually he accepted the custom of giving one's boat a name. He chose an arcane one, a guaranteed tongue twister: Khaggavisana, the mythical creature known as the unicorn, from a Pali poem in the Sutta Nipa. At 4:00 a.m on the morning of May 28, 1969, Sid Genders quietly eased his heavily laden rowboat into the chill waters near Cape Wrath, Scotland. He had 110 days of food and 68 gallons of fresh water--enough, he figured, to get him to the United States. Now, did he have everything else he needed--including no small amount of luck? Scottish seamen from the nearby fishing village of Kinlockbervie stared at him and his 20-foot rowboat as they might have stared at the Lockness Monster. One onlooker, an old salt, offered the opinion that Genders, a big, strapping bloke, looked fit enough. "Fit enough for what?" came the quick retort, followed by laughter. When they questioned Genders directly about the wisdom of rowing a small boat into the treacherous waters off Scotland, Genders smiled and waxed philosophical: "If I die out there, it's better than dying a mental cripple curled up by the fireside." That was perplexing to the men, some of whom thought curling up by the fireside one of life's great blessings. It certainly beat trying to row the Atlantic any day. As Genders pushed off, he shouted to the stunned seamen, "This time next year, I'll be basking in the sun at Las Palmas." "Basking with the sharks is more like it," shouted someone from the shore. "We've said goodbye to a dead man," someone else said. "He'll be a bit of driftwood out there." Genders began sculling toward the open sea, making decent progress until midmorning when squalls from the west stopped him cold. He threw out his sea anchor and hove-to until evening, when calmer seas prevailed. The pattern of gaining distance by night and losing it by day endured for five more days. Conditions then turned truly savage. For the next six days, a bitterly cold storm raged; winds gusted to Force 8. When calm was eventually restored, Genders was 120 miles northeast of his course, in freezing weather. Ice covered the decks, and he had to thaw out his hands over the propane stove just to button and unbutton his clothing. His hands swelled to twice normal size. Eighteen days and four gales later, he returned to Kinlockbervie, ordered a pot of tea at a quayside cafe, and announced, "I'll be trying again." He did try again, this time from southern England, rowing out of Penzance harbour at eight in the evening of September 11, 1969. Two days later, at first light, Genders was awakened by the first of two unsolicited rescue attempts that day. A Royal Navy helicopter spotted him and made a noisy approach. After a few passes, it hovered about 100 feet over the boat and began to lower a chap on a wire. It was blowing hard and the boat was rolling violently. As Genders helped the fellow into the boat, he lost his balance and pulled a muscle in his forearm. Once safely aboard, the man quizzed Genders about who he was and what the hell he was doing. Sid, exuding confidence, said all the right things, and the man seemed satisfied. He soon left, wishing the rower well. Not long afterwards, a lifeboat appeared, and the coxswain told Genders that the skipper of the good ship Scillonian had reported a lone oarsman rowing out into the Atlantic. Since the boat hadn't returned to port, this "rescue" had been ordered. The coxswain did his utmost to persuade Genders to take a tow back to port. Genders said, "Thank you but no." The coxswain warned him of approaching weather: A southwest gale was on its way, and even under normal conditions, the Bay of Biscay had the worst weather imaginable. No one had ever rowed across it, and Genders certainly had no hope of doing it. "Quite a pessimist," was how Genders would later describe him. "He departed a very disappointed man. But no doubt I'm doing these gentlemen an injustice, for they really do a fine job. These two incidents fueled Genders's resolve to succeed, and all that day he sculled with renewed vigor. "Come what may, I don't believe I could possibly have abandoned this venture once having started out. I felt in the position of the man who grasps a tiger by the tail. One has to hang on, as the consequences of letting go would be far worse." Two months and a week after leaving Penzance, Genders sculled into Las Palmas harbour. No one paid him the slightest attention. The most likely place to land seemed to be a fine sandy beach near the Yacht Club, so he ran his boat onto it. The beach was steep and there was too much surf running to haul the heavy boat up. It would be easy, he thought, if the Spaniards lounging on the quay would lend a hand. But they preferred to stare, and he preferred not to ask, so he went searching elsewhere. He approached a schooner with a big chap on deck, who he later learned was a white South African named Mike Humphries. Genders explained that he had just rowed in from England and asked if he could tie up alongside, just long enough to report to the Port Captain. Humphries eyed Genders as though he were a threat to his daughters. "Never mind," he said, "I'll find somewhere else!" Just then a man named Cliff Hill of the Yacht Romany came over and, after hearing the rower's story, invited him to be his guest for a few days. The next day his provisions arrived, and Genders hired a truck to collect them from the airport. Finding room in the boat for such a load was quite a problem. He had over 700 pounds of food, 680 pounds of water, and 200 pounds of equipment. Add to this the weight of the boat and the rower, and he totaled some 2,580 pounds as he sculled out of the harbour. January 14: Twenty days out. I imagine in England the temperature now will be some 50 degrees lower than this, which is 89. I am supposed to be having a hard time of it. But this is really the life of Riley at the moment. On the night of January 31 Genders was fighting another in a series of big seas. The boat was leaping about, like a hyperkinetic frog. It's a hard enough job keeping a rowboat square against the waves when you can see the waves. At night, with no visual clues, it took all of Sid's strength and effort to keep her straight and true. There was little hope of actually propelling the boat at times like this. Suddenly, a 30-foot wave filled the boat to the gunwales. He hove to and bailed. "'Strategic withdrawal,' I called it. I refused to say I was chickening out." A slight lull in the storm gave him time to reflect, and he remembered it was his birthday. Of course, there was no time for the usual celebration. You can't light 51 candles on a cake while trying to survive 30-foot waves in the middle of the ocean. He would later write, "On reflection, I cannot think of a better way to spend one's 51st birthday. A boat and the sea and the sky are better ingredients for my kind of a celebration than a table groaning with goodies and champagne." Sometimes the wind would be just right, and he could let it work for him. "Surfing through the waves feels like traveling 25 miles per hour. The problem then is that the waves break over the stern. Most exciting in moonlight, but not so pleasurable when the boat finally fills with water." Although Sid Genders was extraordinarily capable of being alone for extended periods of time, he was not above certain amusements to pass the time. He played his harmonica so much he wore it out. He carried on prolonged conversations with himself, pretending he was other people, different rowing companions. He would later pass it off as "a normal, healthy reaction to a rather lonely existence." When there were animals around, he would talk to them, whether it was birds, whales, or Sharkboy, as he called the shark that became a regular visitor. "I became great friends with him. He used to come along each morning, just before it got light, and rub himself along the bottom of the boat, just like rough sandpaper. I think he was trying to get some barnacles off himself. It used to cause quite a jolt every morning when he came along." It would always be dark when Sharkboy made his visit, and Genders would get up and shine a searchlight on him. The animal's eyes, each as large as the end of a thumb, would light up like a cat's eyes. After visiting him for nine mornings, Sharkboy must have gone elsewhere to rub his back. Genders was surprised by how much he missed the animal's company. "He was my only mate apart from two birds--a solitary brown shearwater and a white diver with a yellow beak I used to call Prettybird. The shearwater used to come and see me every day." In general, Genders was surprised and disappointed by how little wildlife he had seen on his voyage. "Nothing like the waters around England," he wrote. As Genders's log reflects, he had a rare ability, even in the face of severe deprivation and worry, to appreciate the beauty around him. On March 4, his 69th consecutive day out, having just endured three straight days of vicious squalls, Genders wrote: "Yesterday it was an interesting diversion to see a dolphin having fun being chased by breaking waves. I often saw him with his tail right on the edge of the foam, swimming like mad to keep ahead of it..."
He went on to describe the fish he saw: "...smallish chaps who had the charming habit of turning onto their sides to see above the water." 5th March 70 days out. It was a calm night, though the big swell remains. I discovered that part of the cause of my blistered hands is the new rubber grips recently fitted to the sculls. The raised pattern is quite sharp compared to the old worn ones. He became convinced that he could smell land. He would feel hot bursts of wind that he imagined emanating from inland. At times, he thought he could smell tobacco smoke. And then, at first light on his 73rd consecutive day at sea, he sighted a spit of land dead ahead, very low on the azure horizon. It was the island of Antigua, he was certain. Lacking charts of the region, he had no idea where the harbour was, but that would become clearer as he approached. The morning was calm, the sea flat as a griddle. A whale blew twice, but otherwise the only sound was of timbers creaking and water lapping against the side of the boat. Then came the reminders of distant civilizations: A patch of detergent foam drifted past; high overhead, the faint drone of an aircraft engine reached his ears. It was fast becoming one of the hottest days yet. By 11:30 in the morning, the shade temperature was 96 degrees F., but where was the shade? Not a tree in sight. It was a world suffused in an infinite variety of blues. He lay his thermometer out in the sun, and it read 138 degrees. In that heat, he could scull for only ten minutes at a stretch, followed by a sponge bath with sea water. All the while, he sucked on glucose sweets to keep his mouth moist. The island was farther away than expected. It was always that way. By five in the afternoon, he still had 15 miles to go. He still didn't know where the harbour was, and there were no boats to use for clues. He decided to hang off shore until dark, when the harbour lights should guide his way. While he waited for nightfall, he had plenty of time to think. He thought of where he had been and how far he had come--in all 6,000 miles in 166 days. He had endured contusions, pulled muscles, blisters, cuts, loosened teeth, exhaustion, and seven capsizes. The most difficult part of the voyage--the Bay of Biscay, which everyone had said was impossible and almost was. It was there that he had broken his habit of rowing by day and sleeping by night. One man sleeping alone on an unlighted vessel in busy shipping lanes was asking for trouble. Trouble he knew. One night as he slept, a ship steamed by him so close that it caught his nylon anchor line and snapped it off. The boat's bow was dragged underwater, and Genders was flung to the floor with such force that he sprained his neck. After that, he rowed at night the rest of the way to the Canaries. Dusk begat darkness, which indeed prompted lights to appear, but all along the coast, not just in one place. He was still lost. He knew only that he didn't want to end up on the west--lee--side of the island, because if it turned out wrong, he would never be able to row back. The breeze and currents wanted to push him south, and so he let them. There was no moon and visibility was poor, but he was able to make out several inlets along the way. None seemed like good harbours, although it was hard to tell. After some hours of skirting the coastline, he found an inlet that seemed promising. He could make out the lights of a building at the far end. Just this side of the building were...yes, anchor lights of small vessels. He decided to head for those lights and hope for the best. It was a struggle just to get into the inlet. The current was running strongly against him, and it took all his energy to cross it. For two hours he battled nature, much of the time doubting that he had enough strength left to prevail. But eventually he did, rowing into English Harbour, emotionally ravaged by a mix of triumph, relief, and utter exhaustion. As he drew closer to shore, it became clear that the building was a hotel. In the reflected light, he spotted a raft moored just off the beach. Nearing collapse, he tied his boat there too, figuring to sleep till daylight--or maybe until April. Within moments, a man appeared in a motorized dinghy and told Genders that the raft he had tied to was private. When Genders mumbled who he was and what he had done, the man's face brightened into a smile, as though a switch had been turned on. He invited Genders to the hotel for a drink and a bed. When they got ashore, Sid kneeled and kissed the beach. Looking at his watch--just after midnight--he calculated his time: He had rowed from the Canaries to Antigua in 73 days, 8 hours. He was anxious to send a telegram to his London newspaper, the "Evening Mail," one of the few institutions that had shown any interest in his venture. He owed them an exclusive story, but for now he would just cable the basics. Yes, the Evening Mail deserved to be the first to know. They had supported him, even bought equipment, when few had taken him seriously. Indeed, so disappointed was Genders in the general apathy about his adventure that in the Canaries he had written a letter to the Mail, decrying "the lack of interest in this venture in Britain--so much so that I doubt whether I shall ever return there." Of course, now that Genders had made it, attention would be paid to the man. The Evening Mail's reaction to the telegram was a bold front-page headline: "HE'S DONE IT!" A few days after his arrival in Antigua, Sid gave the Mail his story. In it, and in countless interviews to follow, he answered the question that was on everybody's lips: "Why on God's green earth would a 50-year-old man do such a thing?" He explained that he'd "had enough of the nine-to-five, nose-to-the-tail style of living on a crowded island." He had already raised a family, perhaps one's main purpose in life, and he had been desperate to do something different. "Like most men of my age, I think about becoming old and how one should face it. I would rather face the challenge of the sea, even die out there, than become a cripple in old age. "As much as anything, I set out to show that a man of 50 can overcome obstacles of this kind. Why should a fellow be written off as finished because he becomes 40 or 50? "That is rubbish, and I should like all 50-year-olds to know that and take it to heart." Already of a mind to leave chilly ol' England for good, Genders loitered on Antigua, enjoying the good life and wondering more than once what it would be like to settle there. He enjoyed watching the yachtsmen and their schooners in English Harbour, and thought maybe he would become a Caribbean skipper. He wrote back to England, "The thought of buying a schooner and settling in the Caribbean appeals to me. There is freedom from worry here." But first there was a voyage to finish, for his was a mission unfulfilled. "I shall finish my self-appointed task of rowing single-handed to America. When I started, my intention was clear. It was to get to America. When you get something like that in your mind, you cannot stop....I am impatient to get back to the sea. I like the sea and the challenge it offers. My mind is still fixed to the challenge of the boiling surf and sudden squalls. The final stage through the Caribbean islands to Florida is going to be very, very tricky. But I must go on." And on he went, arriving in Miami on June ?, 1970. In all, he had spent a total of 166 rowing days over 9 1/2 months, covering about 6,000 miles. He was heralded as the first Briton to row single-handed across the Atlantic from England to the United States. No one would ever again call him an "armchair sailor." Postscript: For the next few years, English newspapers continued to run stories about Sidney Genders. In 1972 they reported that the bearded Buddhist had built his own house on Antigua, surrounded by a one-and-a-half acre garden he hacked out of a coastal jungle. In 1981 they reported that he was selling his house on Antigua and moving to Jamaica. In 1985 they reported that he was living in Miami with his second wife. In 1993 they reported that Sidney Genders, 73, had died of a heart attack.